Winter is back, and with it comes Mount Everest’s Seasonal Lease Event! For a limited time ending 11/13, Seasonal Ski and Snowboard Leases are offered at the lowest prices of the season. 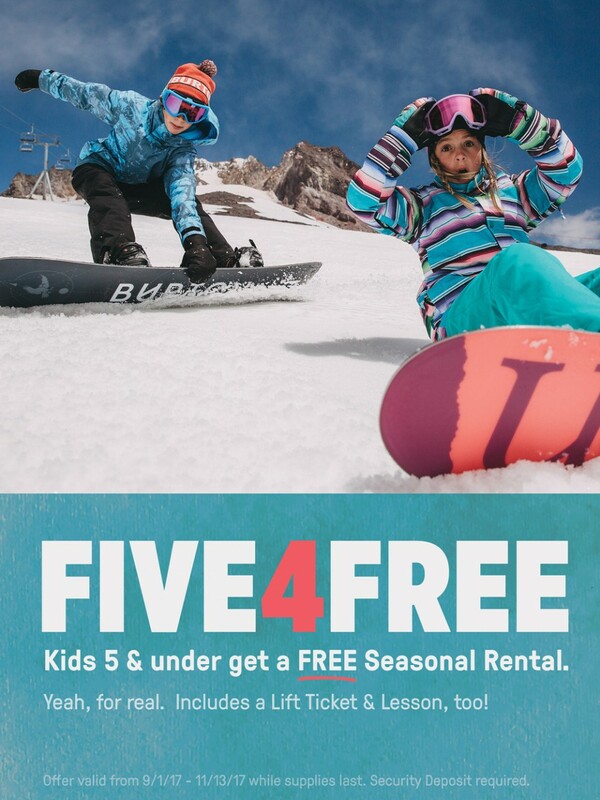 New for the 2017 Seasonal Lease event is the FIVE4FREE program where kids five and under get a Free Seasonal Lease. This includes everything you need to get started; a set of skis or snowboard, boots, and a Free Lift Ticket and Lesson to Campgaw. Priced at $88 during the lease event and usually $108 during the regular season, this seasonal lease is now offered for free. Stop by the shop to get fitted while supplies last! If you miss the sale, don’t stress! Mount Everest offers exclusive lease packages all season! Including seasonal leases as low as $88 for juniors and $128 for adults, and new seasonal leases going for $158 for juniors and $228 for adults. Offer valid from 9/1/17 – 11/13/17. Security Deposit required.